After our hike at Wye Island, we drive to St. Micheals with our growling, empty stomachs reminding us that we need to quickly find a harborside lunch in this quaint village. Our appetites are inconsolable when we arrive in St. Michaels to discover that all the local eateries are shuttered up and closed down. The dockside museum is open but offers no tasty treats, instead serving up the news that the town basically shut down a week earlier for the season. I take a couple of pictures and read the sign explaining why this town is called “the town that fooled the British.” They dimmed their lights and lit a bunch of lanterns down the road aways to draw incoming fire away from their town. The British bombarded the lanterns and left St. Michael’s mostly intact – hurray! 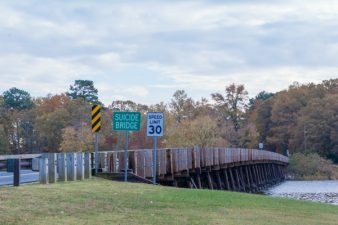 We hate to abandon our visit here as this historic town is just begging to be explored but our fuel levels are too low so we opt for plan B, a visit to Suicide Bridge. No, we aren’t so hungry that we have decided to end it all. Instead Storm is finally taking me to a restaurant that I have been hearing great things about about since we met over 30 years ago. While there are legends surrounding the “suicidal nature” of this bridge, the one truth that I discovered is that the seafood here is as incredible as promised. After a meal of the world’s best crab balls, some shrimp and corn chowder that as Storm says “would make a minnow pull a freight train,” we lick up the last of our savory bread budding as the sun ends a perfect day by slowly sinking into a peachy pink Choptank River. Love the way you write Deb! Thank you very much! Thanks for helping me to find so many cool things to write about. Thank you!! I will have to try and figure out a way to make a book from the posts… A new project :-)! !